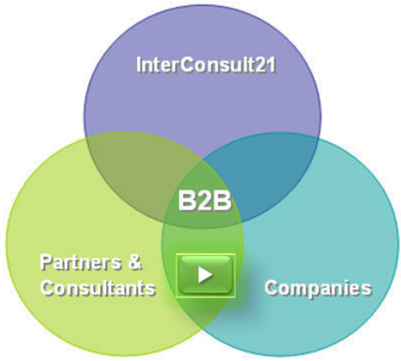 B2B is the result of InterConsult21s Concept, Companies, Partners & Consultants. InterConsult21's Concept deals with Companies / Organizations as well as Advisers, Consultants, Investors, Associations and Business Professionals. To register your Company / Organization in our B2B, you need to add your LEGAL COMPANY ID in the Registration Form. We reserve the right to ask for correct data and the right to check your submitted Company ID. Through this Shopping Site, you can select an Integrated Package that satisfies your business needs. We simplified all our deliverables in just 3 Packages as given at the left side column under Categories. Intensify Marketing is optional for Package III. Regions are part of Package II and III. Legal Non Profit Organizations are Free. All Features / Products listed are included as part of the integrated Packages. We add short description to each Feature / Product. Our vision and concept are explained in Information You Need, our integrated deliverables are described at About Us. The shopping Cart is the interface with you. It is connected to our main domains and servers.